225/365(+1), a photo by Luca Rossini on Flickr. 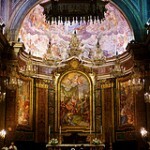 When a nice couple has a nice wedding in one of the most beautiful churches of Rome, our job gets much easier. I don’t have to get mental looking for interesting angles, I simply leave the place to speak for itself. Take today, the fellows bride and groom are Sandra and Gianluca, the place is the Basilica dei Santi Giovanni e Paolo al Celio. 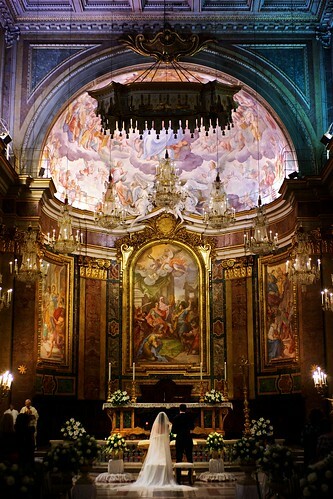 Located in the city center, in the Celio neighborhood, facing the marvelous Villa Celimontana gardens, the basilica is one of those places so majestic that when walking in it you feel both enlighten and miserable at the same time. With this wedding I close the second of two intense and exciting weeks. First, Sony announced the NEX-6 and, with it, publicly released the video about the Alaskan adventure. Then, l’Espresso, one of the most important national magazines here in Italy, commissioned me an editorial and published it as the opening story of the weekly release. What about next week, then? Well, my schedule is already pretty busy, I’ll be in the Netherlands for an European Scientific project from Monday to Wednesday, then I’ll have a couple of intense days in Rome, but I hope to get finally some rest on the week-end.